OVER THE LAST TWO MONTHS, a number of incidents relating to national security issues have sent the railfanning community into a frenzy of hysteria. Well, now that it's Winter, it's time for railfans to cool off. It all started when a number of Al Queda operatives were taken into custody in the middle east. On a laptop in their possession, Federal Agents found pictures of railroad grade crossings and other railroad related infrastructure. The result was an alert issued by the US government warning of terrorist attacks against railroads. THEN CAME TOWER 55, in Texas, where a number of railfans were detained after being reported to dispatch by UP train crews. The ensuing debacle was an all day affair, which began with a single police cruiser, and ended with an interview with a member of the local Joint Terrorism Task Force. In the end, the railfans were released, but cited for tresspassing, a crime which, by-the-way, they were guilty of. On emails lists and in online forums, railfans expressed outrage, and compared the heightened security of the nation to the end of the Weimar Republic. Rumor spread like wildfire, as did hoax messages attributed to Union Pacific and Norfolk Southern warning of major crackdowns against railfans. When John Bromley, UP's spokesman, was quoted in a mid November Washington Post article as stating that "Railfanning, by its very nature, is suspicious (as) it involves loitering, taking pictures and taking notes", he was lambasted. YET, DEPSITE THE RANTING, let's take a look at the facts: the worst that railfans are experiencing is inconvenience. The photographers at Tower 55 were on UP property, and therefore guilty of tresspassing, an infraction for which they were (rightfully) cited. 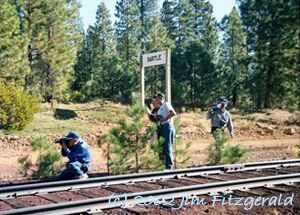 While there is no doubt that the way Tower 55 was handled was a gross waste of manpower, it should be remembered that no one has been arrested, much less jailed, for taking photographs trains. If such a thing occurs, I will be amongst the first out there, sending letters to my Congressman and quoting passages of the Constitution. But that simply is not the case. However, I do have no doubt that some railfans will be arrested soon. Not because they took pictures, no -- they'll get thrown in the klink because they got self-righteous and indignant, and mouthed off to some cop, who was just trying to do his job and go home to his wife and kids, the poor SOB that he is. TO THOSE WHO COMPLAIN that their railfanning freedoms are being stripped, look at what restrictions those back in World War Two had to deal with, and be thankful. They only had to make little sacrifices, such as fighting and dying to save us from genuine Nazis and genuine repression, much less sacrificing the ability to take pictures of trains. But that is nothing -- no nothing! -- when compared to the massive sacrifices we must make by being inconvenienced when pursuing our hobby. If you railfan in today's world, you are likely to encounter the police at some point, especially in urban areas, at junctions, and near bridges. Being stopped and informally questioned is done with good reason. None of us wants to see an attack on the Acela, or on a major western rail bridge, or on any number of other rail related targets. Be patient with the cops, they don't enjoy wasting our time any more than we do.